Merry old England is now more accessible to Filipino business and leisure travellers and Overseas Filipino Workers with Emirates Airline’s new extra service to Manchester.The multi-awarded airline has boosted its route to North West England with the introduction of a third daily non-stop flight to cater for a continued growth in demand. 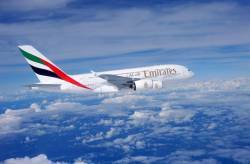 With the additional flight, Emirates has become the first carrier to operate three daily flights to Manchester from the same long haul destination. The new service, which commenced on May 1, 2011, has increased the Dubai-based carrier’s capacity by 25%.Salem Obaidalla, Emirates’ Senior Vice President, Commercial Operations, Europe & Russian Federation, said that by providing the extra flight, Emirates is responding to a great demand for additional capacity on the North West England route.Manchester is a real success story,Obaidalla said.The addition of a third flight just months after introducing our 517-seat A380 superjumbo to the route reflects surging demand for our flights in and out of the north west of England. Gigie Baroa, Emirates Philippines Country Manager, noted that the additional flight to Manchester is a key improvement for air travel all over the globe because it gives passengers from Manila a broader choice of flights to Dubai and Europe.The additional service from Emirates Airline offers Filipino travellers enhanced access not only to England, but also to North West Europe as well,Baroa said.The extra flight will further advance passenger traffic between Manila, Manchester, and Dubai all foremost destinations for business and tourism. According to 2010 statistics from the Philippine Overseas Employment Administration, the total number of deployed land-based OFWs to Europe (new hires and rehires) was 48,185; the total number of deployed land-based OFWs by country new hires and rehires to the United Kingdom was 5,284; the total number of deployed nurses to the UK by top 10 destinations, new hires was 350; the total number of deployed caregivers to the UK by top 10 destinations, new hires was 10; while the total deployment of seafarers to the UK by top ten flags of registry was 11,805.